For those of you who are fans of proto-freelanced model railroads or just fans of really well done layouts, you owe yourself a visit to the Michigan Interstate St. Clair Sub blog. It can be found here: http://michiganinterstatemodelrr.blogspot.com/. You can also find it listed in the Great Railroad Modeling Sites sidebar on the right hand side of this blog. The Michigan Interstate is the creation of Greg McComas and he has done a remarkable job of just about everything associated with the planning and execution of his concept. You can read the complete history of the railroad on his website, but in summary, it's an amalgamation of a number of ex-NYC/PRR/PC branches in Michigan that were spun off at the formation of Conrail. A map of the railroad can be found here: http://michiganinterstatemodelrr.blogspot.com/search/label/Network%20Map. 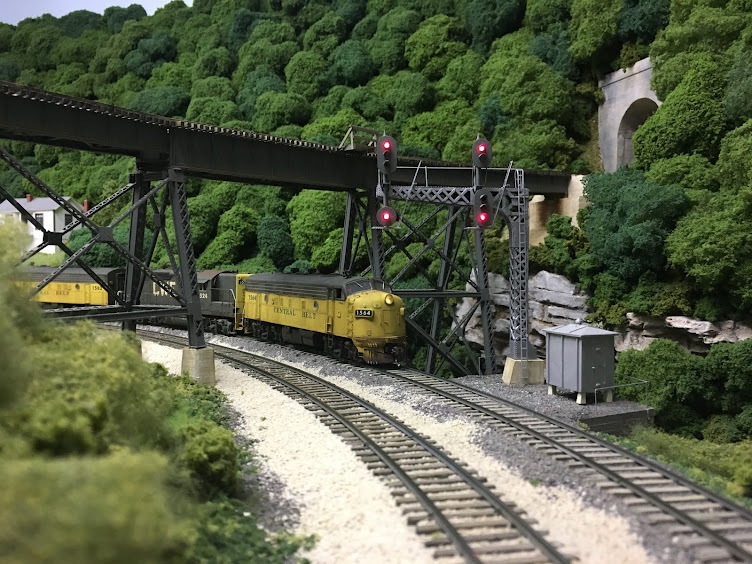 In addition to being a prolific modeler, Greg also posts frequently on his blog on a wide range of topics relating to the railroad. The expansive listing on the right-hand side of the blog shows the breadth of the posts. The MCIS is set in the present, but Greg suggested that we come up with a way to have the CWE represented on his railroad and vice versa. You can find how the present day CWE provides coke to Michigan Sugar in Upper Huron on the MCIS here: http://michiganinterstatemodelrr.blogspot.com/search/label/CWE. And there will be some covered hoppers on the CWE in MCIS reporting marks in the near future. As the railroad was formed in 1976, the cars will be a combination of recent repaints along with some NYC/PRR/PC patch jobs. The opportunity to do a few MCIS cars will add some interesting variety to the fleet. And it's another neat way to enjoy this great hobby of ours. The mysterious case of the missing boxcar has been solved. It was found on the mainline inside the tunnel just east of Nelsonville under the most curious of circumstances. Actually, I was testing the westbound signal at the east end of Nelsonville when it was found. The westbound signal for the main and the westbound signal for the Dry Fork Branch were installed a while back and hooked up to SBS but without a spreadsheet to control them. This past Tuesday, I wrote the spreadsheet and set about testing the signal. I ran the two SW1200's that serve as the yard engines at Nelsonville east down the main toward the station. Once past the station and the westbound signal on the main, the switchers entered the tunnel to east staging. I ran them in far enough to get the westbound signal to clear to green and then reversed direction. When they emerged from the tunnel, I was shocked to see what's in the photo below. As best I can figure, some goofball pulled the Dry Creek Turn out of staging (in the tunnel under the bridge) and then shoved the train into the tunnel on the right which heads toward the east staging yard. When the goofball pulled the train back out, the K&LE boxcar, which would have been the first car on the train, stayed in the tunnel. Let's just say that we all know the name of the goofball. Actually, I had some problems with the GP7 that was on the train and pulled it off while the train was still in staging. At some point I pulled the rest of train out of staging, but I have no recollection of shoving it up the main into the tunnel. Or pulling it back out. Truly one of the more bizarre occurrences in all of my model railroading experiences. I really couldn't believe the boxcar was attached to the switchers when they came out of the tunnel. And so, Mr. Miller, it appears I owe you an apology. It's clear that my insinuation that you may have been associated with some type of prank with this car was completely unfounded. This time. Really. I mean it. In the process of staging the railroad for an upcoming op session, I discovered a missing freight car. It appears that K&LE 50829 has left the building. I have a car card and waybill, but no freight car. It was supposed to leave Nelsonville on the Dry Creek Roustabout at the end of the last session. I've checked staging, the floor under the layout, all of the yards, the tunnels, all to no avail. Below is a picture of the poor missing car. If anyone spots the missing car, please call the authorities immediately. In between rebuilding panels with pushbuttons and adding signals, I've been working on some new rolling stock. Last summer, Bowser came out with the classic woodchip hopper car based on a rebuilt 70 ton 3-bay offset hopper car. I had planned to kitbash a handful of these, but Bowser saved me the trouble. They even offer both a smooth side extension and a panel extension. These cars were originally built for coal service in the late 1950's. In 1962 and 1963, the CWE shops added extension to a number of these cars and they were converted to woodchip service. The first car is shown in the original paint scheme while the second car has been repainted in the modern scheme introduced in 1968. The "Wood Chip Service" lettering comes from Microscale set 87-1339 Seaboard Coast Line Misc. Wood Chip and General Service Gondolas. Each sheet contains four white and two yellow "Wood Chip Service" strips- enough for three cars! Finding these decals was pure luck. The font just happen to be in an almost identical font to the lettering I had used for previous woodchip hoppers, only larger. And the color of the yellow is just close enough to the UP Armor Yellow on the ends to work. In fact, it was the yellow woodchip lettering that provided the inspiration for the earlier paint scheme. It's nice to get really lucky every once in a while. Look for a post on the entire woodchip fleet sometime in the near future.